At TABtouch we’re committed to bettering your bet, and we are making it easier to build your bets and get on with our new and improved Betslip. TABtouch recently introduced Quickbet to make placing each bet fast. Now with our redesigned Betslip, coming this week, multi betting is also quicker and easier than ever before. This means that you will see a few changes next time you use the TABtouch app. Below are a few pointers to help get you started using Betslip. 1. Make a selection and then press “Add to Betslip” at the bottom of your screen. Your bet will immediately be added to your Betslip where you can add your spend when ready. 2. Make a selection and then press the “Quickbet” button. 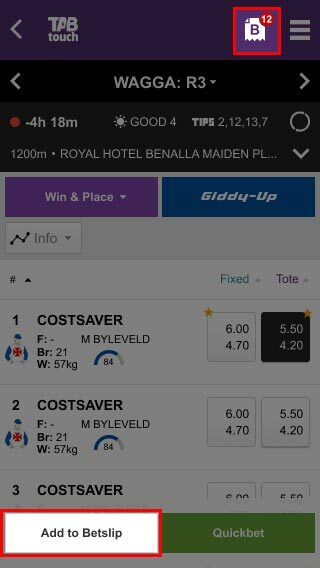 From here you can pre specify your spend before pressing “Add to Betslip”. You also have the option of placing the bet immediately via Quickbet by pressing the green “Bet” button if you prefer. 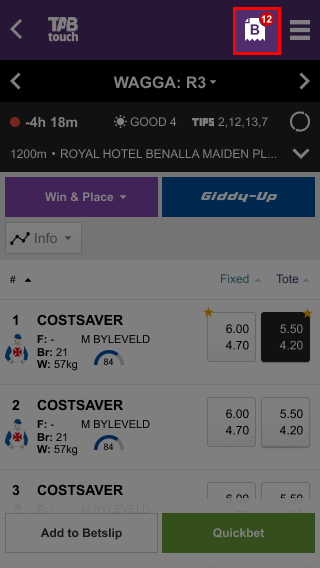 You can access the Betslip at any time by pressing the “B icon” at the top of the page. If a number is shown it corresponds to the number of bets in your betslip. You can also access the Betslip via the “My Bets” menu. When you view your Betslip you will see it is separated into two sections. 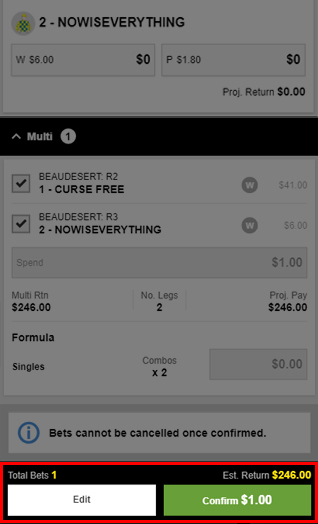 The first section displays all of your “Single” bets, the second section shows your ”Multi” bet. You may need to scroll down to view your multi bet. You can also view your balance and deposit at any time from the link at the top of the Betslip. To place a bet you need to enter how much you wish to bet in the Spend section of each selection. Only bets with a spend specified will be placed, any bets with a $0 investment will not proceed to the next stage of placing a bet. For example if you only want to bet on the multi and not your single bets only enter a spend against the multi. The bottom panel of the Betslip shows you how many bets you have entered a spend against, the total estimated return of all selected fixed odds bets and the total spend of all your bets if you proceed. 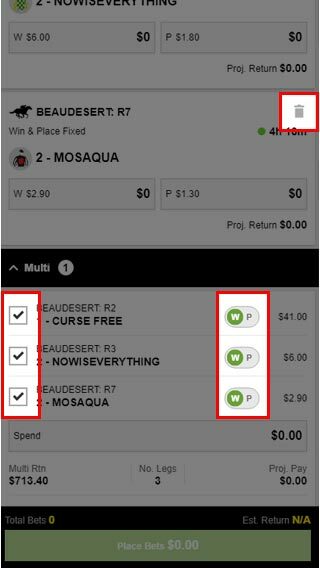 Once you are happy with your selections press the “Place Bets” button where you will be asked to confirm your selections. Please make sure you check as we cannot cancel bets once they have been placed. 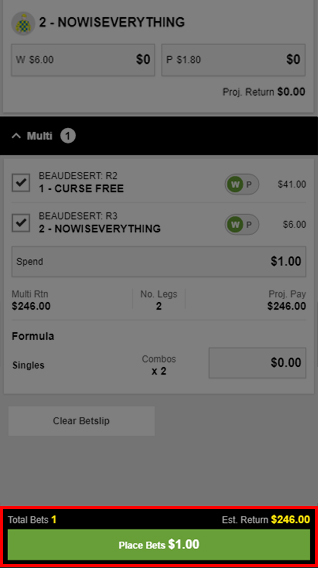 To build a multi all you need to do is add any bets you want to include to the Betslip, any fixed odds bets will automatically start to build a multi for you. 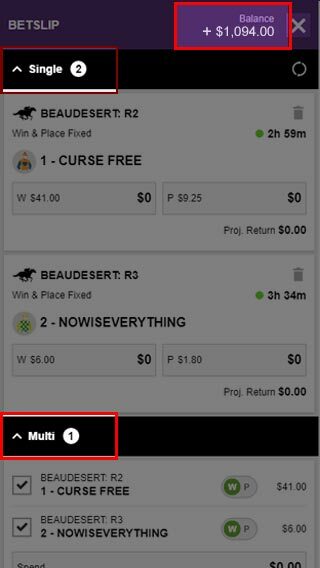 You can review your multi and include or exclude legs either by using the tick boxes in the multi section or by deleting the corresponding selections from the singles area of your Betslip. Fixed Odds Win or Place bets contained in your multi automatically default to a Win bet. 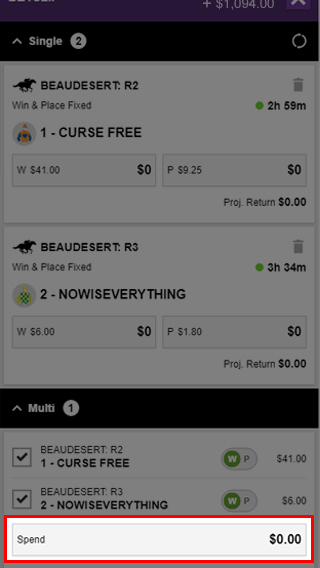 You can adjust this to a Place bet or revert to Win by toggling the W or P next to your selection to green. As you add a spend or make changes to your multi you will see your Multi Return and Projected Pay update. The Bet Slip allows you to place your Multi Bet at the same time as your Single Bets. For any bets that you do not wish to place simply leave the Spend amount at $0. If you are placing one bet at a time you can still use the Quickbet feature to get on as fast as possible. However whether you are placing novelties, win and place bets, sport or racing selections you now have the choice of collating all of your bets in the Betslip. From here you can view all of your proposed bets, manage your spend, create multi’s and place all or some of them at once. 1. 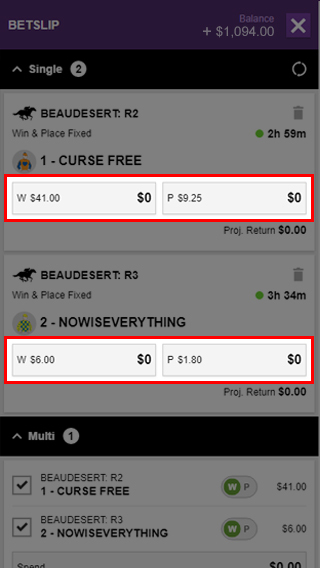 Click or Tap in the Stake field to the right of the Combo option you want (the default is displayed as $0.00). 2. Choose your investment amount which will be applied to each combination in your formula option. For example, a $2 investment on a formula which has 4 combinations will add $8 to your stake. This is reflected your total stake amount for your bets in the “Total stake” field at the bottom of your bet slip. 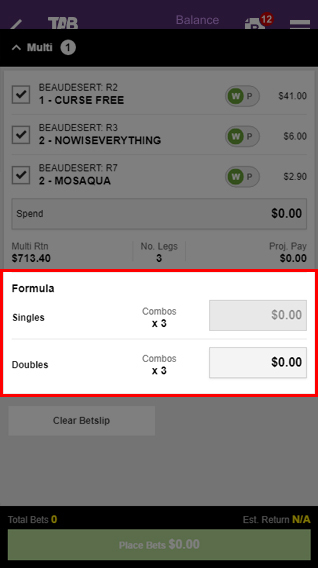 If you don’t want to place a Multi Formula Bet, simply leave the formula stake amount as $0.00.